Elana Wolff recently sat down (albeit electronically) with Open Book to talk about her latest publication and the books that inspired her as a young reader and writer. No surprise then that her latest book, Guernica’s first flip book, is a dual translation of Kafka and Langer’s work. 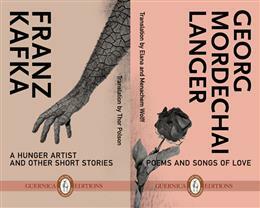 Having stumbled upon several mentions of Langer, one of which stated that “the importance of the friendship between Kafka and Langer had been ‘largely overlooked. '”, Elana decided to set out and find Langer’s elegy of Kafka and uncover what she could about the little-known writer. The hunt that followed, which included a trip to Tel Aviv and fruitless searches in rare bookstores, is a story in itself and was recently written about in The Huffington Post. The final translation, available for the first time to English readers has been described as “absorbing” and a “rare gift”. Copies of A Hunger Artist and Other Stories; Poems and Songs of Love will be available at the Guernica booth at the INSPIRE! Book International Book Fair. And, on Sunday, November 16, 2014, Elana Wolff will be signing copies from 2:00pm to 2:30pm. Elana Wolff has published four collections of poetry with Guernica Editions, including You Speak to Me in Trees, awarded the F.G. Bressani Prize for Poetry. She is also the author of Implicate Me, a collection of essays on contemporary poems; co-author with the late Malca Litovitz of Slow Dancing: Creativity and Illness (Duologue and Rengas); and co-editor with Julie Roorda of Poet to Poet: Poems written to poets and the stories that inspired them. A bilingual edition of her selected poems, Helleborus & Alchémille(Éditions du Noroît), was awarded the 2014 John Glassco Prize for Translation (translator: Stéphanie Roesler). Elana has taught English for Academic Purposes at York University in Toronto and at The Hebrew University in Jerusalem. She currently divides her professional time between writing, editing, and designing and facilitating therapeutic community art courses. Tagged with A Hunger Artist and Other Stories; Poems and Songs of Love, Elana Wolff, Franz Kafka, Georg Langer, Open Book, Poetry, The Huffington Post, translation.